When I originally saw this video I thought, “That’s cute. Some black metal guys clowning around between sets.” But no…this is infinitely more wonderful. The video is by black metal group The Black Satans, for their song Satan of Hell. A heroic YouTuber changed the music to Yakety Sax. The result is sublime. Brute Force Studios – Creators of gorgeous steampunk leather items (including intricate corsets) and other pretty things. The Hungry Little Hunter – A Little Golden Book cover parody featuring the Predator. There’s also an “Aliens” Facehugs for Everyone. The artist has a bunch of similar video game-themed work in his Etsy shop. Medieval Magic Wedding – There’s some great inspiration here. Ringwraith Cloak – Attractive LOTR-inspired design. Serial Bowls – Set of cereal bowls decorated with photos of famous serial killers. They apparently used to be carried by Urban Outfitters, but have been discontinued. Dracula citrina – Variety of orchid that looks like monkeys on sticks. Sleep Paralysis in the Works of Edgar Allan Poe – A neat essay on references to this condition in Poe’s works. Pinstrosity – Site devoted to failed Pinterest projects. Man, the Victorians just beat us hollow where creative mourning is concerned. Parlor Domes–bell jar-type glass display cases–were a hugely popular part of Victorian decor. Also hugely popular was any kind of memento mori woe-is-us sentiment. 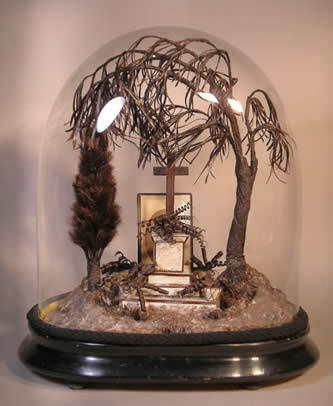 Put ’em together and you get gorgeous pieces like this French cemetery scene, containing hair from the deceased. They put me in mind somewhat of the desktop cemeteries I did a couple of years ago, but I think I might like these even better; the view of the interior is clearer and I love the way the tree fills the dome. Something like this–with or without the hair–would be relatively straightforward to make. Glass display domes are available at craft stores and trophy shops. Miniature trees and other landscaping details are widely used in model railroad layouts, so there’s a large variety, in several scales, to choose from (this weeping willow and this dead maple are nice). Tombstones, crypts, iron gates, and other cemetery accessories are available for both model railroads and dollhouses; ditto the ground cover and materials used for building up the substrate. The finished dome would be a lovely addition to a desktop or mantel. If anybody accuses you of being morbid, inform them that such displays have a long historical precedent, so there. When Flappy Bird hit the scene, developer madgarden realized that it was sorely lacking in lurking horrors. The remedy for that was FlapThulhu, featuring the most adorable little 8-bit Old One that you’ve ever seen. It’s available for name-your-own-price download at Itch (currently only for Windows, but Mac and Linux are in the works). It’s also just been made available in the Apple Store. The same developer has a couple of other interesting games, including Eggnog, described as a “local multiplayer stabbing game,” which may be one of my favorite game descriptions of all time; and Saucelifter, in which you pilot a UFO in hopes of saving your stranded crewmates from the aggressive Earth military. Seven Deadly Sins (updated): PWN’D, NOM, FFFFFFFFUUUUUUUU, WANT, WANT, WANT, and meh. “You’re not the person I fell in love with!” is a fun thing to say to anyone who isn’t the person you fell in love with. A good way to make a car dealer uncomfortable is to say, “Tell me if you can hear this,” and then get in the trunk and start screaming. I make sure people who claim they don’t have time for my nonsense remember they weren’t doing much when I found them so actually, they do. SCIENCE FACT: Your throat hurts when you’re sick because your white blood cells have brought out tiny swords and are dueling with the germs. I’m not a cyber-bully but I did change my WiFi network name to “I CAN SEE WHAT YOU ARE GOOGLING STEVE”. Sleep well neighbor. Sleep well. Yesterday: Used poor grammar on multiple occasions. Today: Hiding from grammar zombies in the attic. This stop-motion animation by Toshiko Hata won the 2012 Jury’s Choice for Short Film at the 2012 Puchon Inter­na­tional Fan­tas­tic Film Fes­ti­val. It is creepy in the way that only Japanese films seem to be able to pull off. Fairy Hunter – This awesome artwork from Davesrightmind depicts one of the natural predators of fairies. Head in a Jar – Easy, striking kid’s costume, which appears to be inspired by this how-to guide. xJane, who sent the link, plans to make a Marie Antoinette version for herself. Horror Fiction – A good roundup of vintage-y, free, fiction. Creepy Skull Slouch Hat – Crochet pattern for a hat full of li’l skulls. Steampunk “Thing” – Lovely sculpture which reimagines the Addams Family “Thing” as a clockwork hand. 8 Hilariously Nonthreatening Monsters from Japanese Folklore – A list of creatures who are somewhat less horrifying than ghostly long-haired little girls. Armor Corsets – Although these look like they’d be rather ouchy to sit down in, they’re undeniably lovely. Freya Jobbins – Artist who makes sculptures out of doll parts. A little NSFW; really damn creepy. Colorized History – There’s a whole subReddit devoted to colorizing old photos. LEAP provides a small sample. These go together really fast, so after you fill your uniform with them, you can make extras for personalized party favors or just to award randomly to friends and co-workers (“For meritorious service in clearing the copier jam, I present you this medal of honor”). All the gory details are right here. Two odd “meaty” things have come across my purview lately, which is my cue to pretend they’re related and try to hang a post on them. The first was a wonderful refrigerator ad campaign done in Germany. 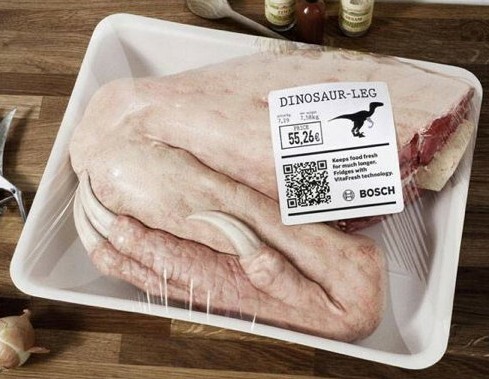 Bosch’s “VitaFresh” technology promises to keep food fresher longer, so they placed packages of “fresh dinosaur meat” in supermarkets to hyperbolically illustrate how long they could keep food fresh. I adore this kind of fake-artifact thing; the packaged “meat” puts me in mind very much of the products sold in 826 stores. It wouldn’t be terribly difficult to create something similar out of carved styrofoam and/or polymer clay, and they’d make awesome decorations at a time travel-themed party. The other meat-related thing is BiteLabs, an organization which purports to grow meat from “celebrity tissue samples” and use it to make artisanal salami. As Freddy stumped wearily through the door after another fruitless day of job-searching, Jennifer couldn’t help wondering, once again, what her life might have been like if only she had married the Goblin King instead. Get the idea? Want to play along? Submit your own caption in the comments!